I returned from a trip downstate on Saturday morning, and did the usual rounds. I looked at the length of grass in the lawn, the state of the weeds in the garden, and the wine. 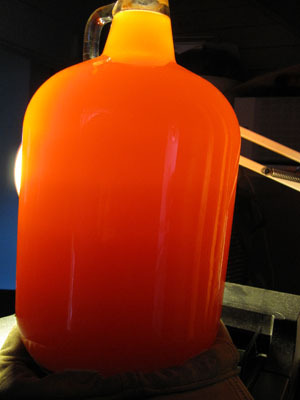 I racked the Strawberry Wine before I left, and when I got home, it had started to clarify. In order to take this picture, I put a bright light behind the glass jug. I happen to think the color of this wine is lovely, and that the picture does not do it justice. I used some very nice local berries, trimmed each one with a knife, removed all the bad spots, chopped them up, and put them into the straining bag. The red color of those lovely berries just jumped out at me. I think we somehow know what good strawberry juice should look like when it is treated properly… it should look like the picture. I also think that unless they charged $100 per bottles, no winery could make a profit making wine the way I do. So they use berries not quite up to my standards, do not remove the bad spots, leave on a stem or two, and the result is a somewhat different color. So to fix it, the big wineries add color. This entry was posted on Sunday, July 21st, 2013 at 9:36 pm and is filed under Uncategorized. You can follow any responses to this entry through the RSS 2.0 feed. You can leave a response, or trackback from your own site.